THE WRECK OF THE LIFE-BOAT. Copyright, 1890, by Harding Brothers. She's thinking, yes thinking, of that night twelve months ago. Thinking of Jack, wishing him back, praying for those on the foam. Never will she her sailor see, or give him a welcome home. We joined the crew of the life-boat, first to the rescue was he. 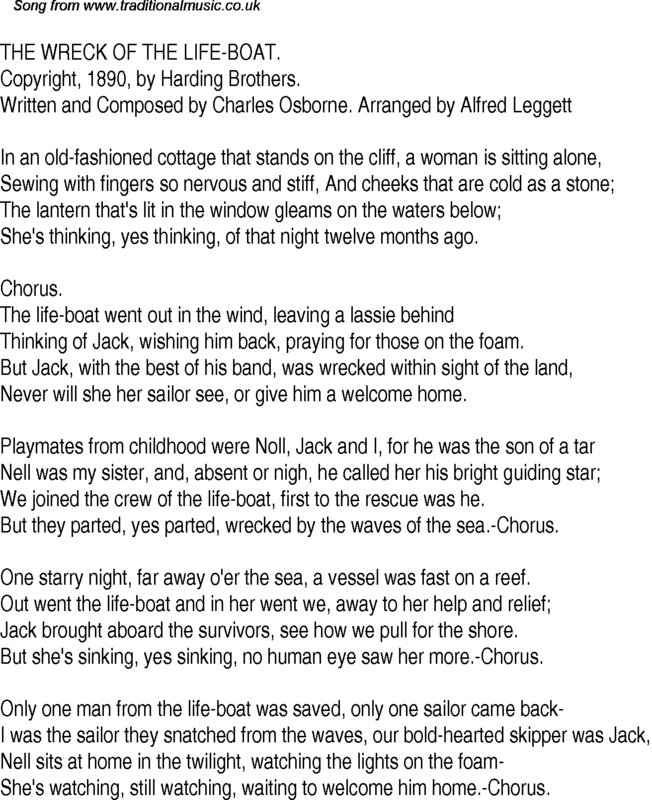 But they parted, yes parted, wrecked by the waves of the sea.-Chorus. One starry night, far away o'er the sea, a vessel was fast on a reef. Jack brought aboard the survivors, see how we pull for the shore. But she's sinking, yes sinking, no human eye saw her more.-Chorus. Nell sits at home in the twilight, watching the lights on the foam�She's watching, still watching, waiting to welcome him home.-Chorus.